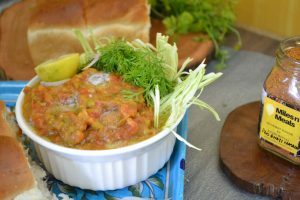 Pav Bhaji, Once a Poor Man’s Meal, is now one of the most sought-after dish in each vegetarian household. There were times when mom found a tough time making us eat vegetables, with my sister being a fussy eater. She found this humble Bhaji the best way, using almost all the vegetables in her kitchen and then a big dollop of butter which I could see melting down the bun. We happily thought that we have been on a treat, least did we know that it was our dose of carotenes and vitamins been fed in a disguise. But who is complaining? 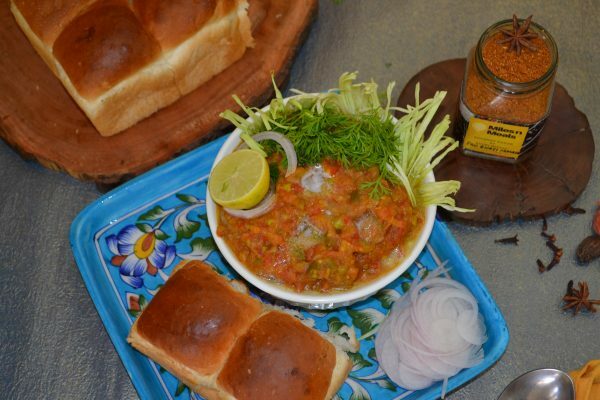 Pav Bhaji is called poor man’s meal as it carried all the vegetables dunked in butterfat and served with Pav. 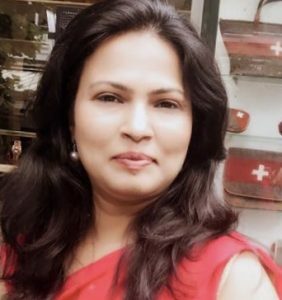 Served all across Mumbai, Maharashtra, on Carats, One can see fumes of sizzling butter on large Tawa ( Girdle) and crowd encircling the cart for that one divine bite of Pav Bahji. Though a special bun is available in Maharashtra and many adjoining states, is called Ladi Pav is much softer and smaller than the regular Pav available here around in Delhi, I have all my life been eating the Bun available here. While in Mumbai, Realised the difference in flavour and texture of what is served there. The method of making Bhaji also differs from household to household. While it is much garlicky in Maharastra style. Mom made it just with tomatoes all her life, as we were No Onion No Garlic Household. I picked up the onion, garlic recipe from my aunts, and then refined it to my taste. 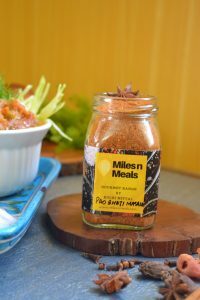 Mom used to make her own Pav Bhaji masala, and this spoilt us for choice, as I also never used store bought masala, though have tasted it many times at friends place. In a Homemade masala, one can fine-tune the chili content and keep the mango powder in control ( I am allergic to the sourness provided by Dry Mango Powder). 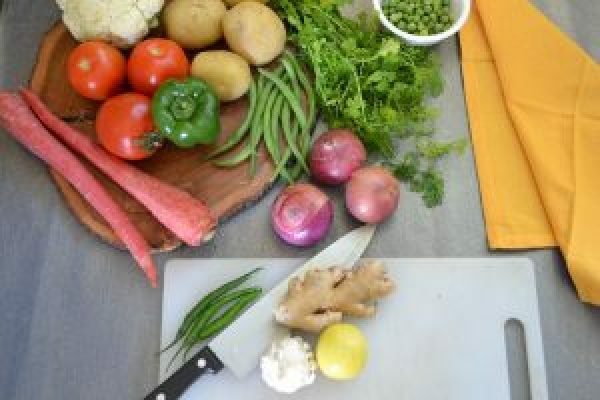 This recipe has Spice mix recipe, which can be used to make your own homemade spice mix, which can be stored in an airtight container, for up to two months , or beyond depending on weather conditions. The butter plays a major role in bringing true flavours of Pav Bhaji. I suggest liberal use butter in Bhaji, and while toasting the buns. Still, remember mom putting that extra dollop on my bhaji, And I would happily smear my bun, in the melting butter along with that super delicious bhaji. 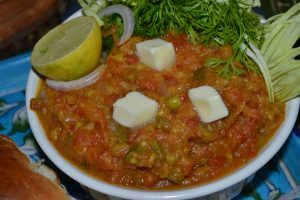 Pav Bhaji Is a popular street food of Maharastra and more popular as an all-time snack in Mumbai. Its a mish-mash of vegetables and spices served with loads of butter and special Bread called Ladi Pav. Pressure cook all the diced vegetables for two whistles with 1.5 cups water. Meanwhile, heat 2 Tbsp Butter in a heavy bottom Pan. Add Chopped Onions, and cook till they start getting soft. Now add Ginger Garlic Paste ( use 1 inch ginger cube and 5-6 cloves garlic and gring coarse in blender or pound in mortar pestle), and cook till raw smell of garlic disapears. Now Add Tomatoes and green chilies, Chili powder, and allow to cook till it gets mushy. Add cooked vegetables, Pao bhaji masala, salt and use a potato masher to mash the vegetables along with the tomatoes. Allow it to cook for 2-3 minutes on medium flame. Now Add lemon juice and butter on top, and garnish with paneer(cottage cheese) cubes, and chopped green coriander. Slice the pav from centre and toast on a girdle using butter. Serve with hot bhaji and Onion Rings, with an extra dollop of butter if desired. Dry Roast all the whole spices. allow to cool, and grind to fine powder. Add Powdered spices, mix, and store in an airtight glass jar. I like to use less of dry mango powder in my spice mix ( As the quantities mentioned above). This recipe will need an extra hint of lemon juice. Adjust the sourness to suit your taste. Use more vegetable combinations, if wished.